Liz Smith | Sizzle: When The Media Sizzles, You'll Find It Here! James Dean or James Franco? Doesn't matter; we love them both! Jeff Probst: Hosting a new show called Live Like You Were Dying. Except the people really are dying. That’s not, you know, sad, creepy or weird at all. Gossip Girl: Meta quote of the episode: “Who watches TV on a TV anyway?” Ah, the good ol’ days. Sarah Palin: Are some conservatives only backing her because she’s hot? Some people think so. Nicole Richie: Quoted in PEOPLE: “I tell [babydaddy] Joel ‘Even when I’m really mad at you, I could never really hate you because you look like Harlow.” Now that’s what love and long-lasting relationships are built on! SNL: The show has experienced a resurgence as of late but what will happen when the election is over? 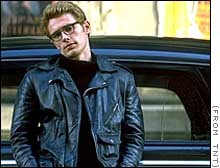 James Franco: We just watched him in James Dean–the movie, not the person–and now we’re kind of obsessed. And then to find out how much he values education–he’s going for his masters–well, we just found our dreamboy! STILL SIZZLING: Which actor–who appeared in the closing minutes of the first film–will play a larger role in the Iron Man sequel?